The European Union (EU) through the 10th European Development Fund is allocating EUR 3.5 million (FJD 7.75 million) to further develop the coconut industry in the Pacific. 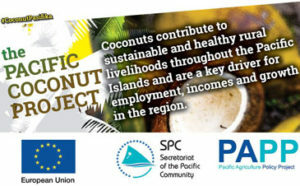 The Pacific Coconut Project will be implemented by the Land Resources Division of the Secretariat of the Pacific Community (SPC). A three-day regional consultation (30 March – 1 April) was held this week in Nadi to review and endorse a project design on a way forward to develop the coconut sector in the Pacific and to begin groundwork for a new Pacific Regional Coconut Strategy. In his official opening remarks, Fiji Minister for Agriculture, Inia Seruiratu, said he hoped the Pacific Coconut Project would assist governments to put in place a policy framework to further develop the coconut sector especially through value addition. “The coconut industry in the Pacific is in the process of transition from copra to a more remunerative industry. Coconut industries therefore need to reposition themselves not to miss out on benefits,” the Minister said. “While being mindful of profitability, we need to also study and promote the enabling environment and policies to catalyse investment. The target actors are the private sector, the farming communities and other key players like the banking sector,” he said. European Union head of economic and social sectors, Jerome Pons, said several countries in the region maintained a significant interest in the coconut industry. “There is a good potential for the coconut sector in the future to work on value addition, focusing on small volume, high income products, such as coconut oil. This is much more than just producing copra in general, it is quite a niche market that can develop. Deputy Director of SPC’s Land Resources Division, Sairusi Bulai, said coconut industry stakeholders needed to re-examine the possibility of creating products using wood from senile coconut palm. Mr Bulai said they had identified some products earlier but commercializing them had proven to be uneconomical. “With the technological changes that are happening and changes in consumer demand and preferences, it’s an opportune time to go back and re-look at some of these products. For example, commercializing coconut logs into high value veneer is becoming more affordable compared to technology available 10 years ago,” Mr Bulai said. “Turning senile old palms into profitable, high-value niche products helps conserve forests and improve livelihoods for island communities. “There are many opportunities that exist for coconuts but they all require well-targeted and timely support to our industry,” he added. On the global level, market demand for coconut products is changing as more by-products are being commercialized in important markets like the US and Australia.